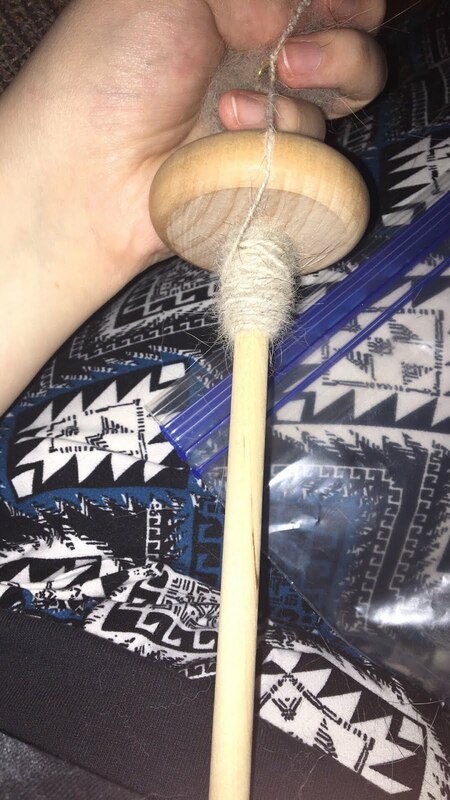 I recently started my spinning journey and so far I love it (you can read my first post about it here ) and am having an amazing time with it. 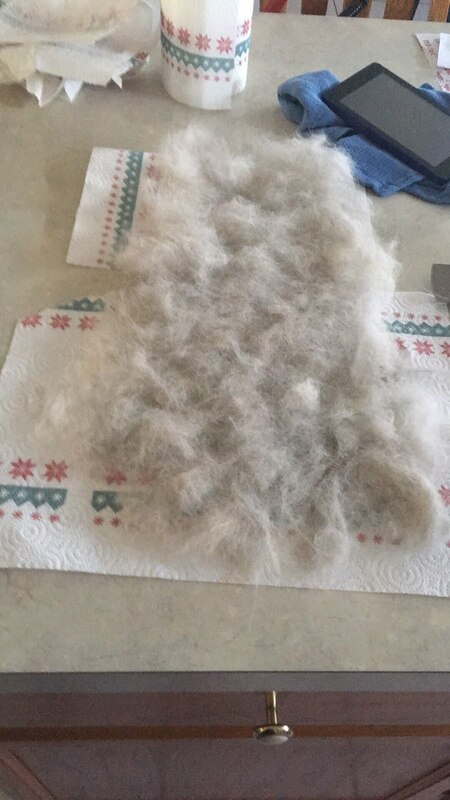 Recently I was hanging out at my friend's house and I made a comment that her dog's fur would probably be perfect to spin since she has a husky who has very long fur. She immediately agreed so we busted out the dog brush and went to work. Now her husky is very vocal and was not happy that we suddenly were all over him with brushes. He loudly protested the brushing and let up know he did not want to be brushed at the time. We didn't get very far but we did get a decent amount of fur off of him. I took it home and washed it, it did smell a little bit but being through the wet dog smell went away. I got as much of the water out of it as I could and set it out on paper towels to dry for a while. Once it was dried I realized I forgot that usually, people use carders to brush out the fiber. I don't have any yet but always confident in my improvising abilities I took a regular comb to it fluffing it out a bit and sat down on my recliner with the large ball of fluff to see what I can do. My first try didn't turn out too well I was trying to spin to thick and it didn't want to agree with me. 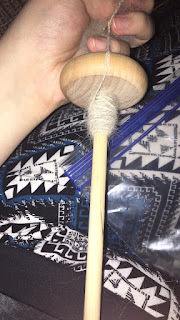 I scrapped it and decided to start again this time spinning much thinner than I originally did and it worked amazingly! It took a little trial and error but I finally figured it all out and spun the whole batch of fur pretty quickly. In under a day, everything was gone and now I have no more spinning fiber. I have a friend who grooms dogs for a living I showed her the finished spool of spun dog yarn and she offered to give me as much dog hair as I can handle so I don't think I'll be short on fiber any time soon. This was the most ambitious thing I've done with spinning so far especially considering this is only the second thing I've tried spinning I think it went pretty well and motivates me to spin even more. I crocheted all the yarn and the little swatch ended up looking amazing its super soft and doesn't smell like dog at all I absolutely love it and want to work with dog hair much more in the future.